Rustan’s Department Store remains to be the premier retail destination for many of the world’s most prestigious brands and merchandise. With decades of giving Filipinos the best service and experiences, Rustan’s continues to give the finest there is. 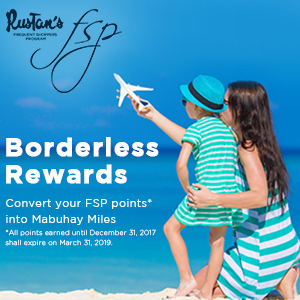 Alongside Rustan’s is the FSP or Frequent Shoppers Program designed to reward the most loyal customers. Through the years FSP has introduced exciting offers, exclusive events and most recently an app designed to complement the shopping experience in an ever changing time. * All points earned until December 31, 2017 shall expire on March 31, 2019.